A kids indoor play area is a great place for kids to burn off energy during the winter when it's too cold outside, especially for toddlers and preschoolers. Winter is not the only time we make use of inside play places. They come in handy when it's too rainy or muddy during the spring or when the heat index is too high for running around out in the sun. Indoor playgrounds can also be good options to meet for play dates as well as host birthday parties. Chasing Tales is by far one of our favorites for indoor family fun. They have a nice spacious area to play with balls, jump ropes, hula hoops, etc. There is a large slide to climb, ride on toys and tricycles, plus a smaller playset and various toys for older babies and toddlers. The kids can take a break from running around to paint in the art area or play with blocks, cars, grocery store, or dress up in another section. Make a day out of it and pack a lunch! There is a designated space for eating lunch and snacks. We typically go there on the weekends, but throughout the week they frequently have different activities and classes which sound fun. The Big Backyard is truly like an indoor park with large playground equipment, ride on toys, as well as infant toys to play with. The larger play structure has tube slides and requires a bit of climbing which can be a little overwhelming for the little ones, but it great for preschoolers and early elementary aged children. There is also a section for eating. We had our daughter's fourth birthday party there. Kids in Motion is a large building with themed play rooms (like dress up and grocery store), laser tag, art supplies, and a play structure. There are several couches for parents to sit on to chat and watch over their kids near the play structure. It can get quite crazy on the weekend, but they also host a variety of events throughout the week. Monkey Joe's is an indoor play area with lots of inflatables for kids to bounce on and slide down. There are a few arcade games as well as a concessions stand (no carry in food allowed). There is a “mini monkey zone” for toddlers to enjoy. The Children's Play Gallery is a great place to go for imaginative play. They have an international marketplace, construction zone, an art center, a science discovery area, a stage, and a large pirate ship. There might not be as many activities for running and jumping, but it is a great place to visit to let the kids play and learn! Bounce Milwaukee is a fun indoor play space for kids AND adults. They have laser tag, a rock climbing wall, and inflatables. On Friday and Saturday nights after 9PM it is only open to adults 21 years and older. Go for a play date, go back for date night! There is plenty of hands-on learning to do at Betty Brinn Children's Museum, which makes it an ideal indoor activity for kids 10 years old and under. There is lots of interactive play to help kids learn about science, music, and use their imagination. The kids won't be able to stop bouncing around at Jumping Country. This place features lots of inflatables: giant slides, obstacle courses, and sports games. When you purchase a pass you can leave and re-enter, which is perfect if you want to step out for lunch. Flabbergast describes itself as a “super fun indoor family adventure.” Which sounds like something all parents need for their kids from time to time. They feature a variety of indoor inflatables, a toddler jump house, an arcade, a cafe, a lounge, and a child electronic security system. Feel like the kids are bouncing off the walls? Then they need a trip to Sky Zone where they can jump out their energy on the trampolines. Jumpers are separated by ages for safety reasons. There are a variety of activities such as the Foam Zone, Dodgeball, and SkyFitness. There are special hours for Toddler Time on Friday and Saturday mornings, which is designed for kids ages 5 years old and under. Just 4 Fun has an indoor playground for kids, a cafe for snacks, and also a preschool and daycare. It is a great spot to meet for play dates. Bounce Realm features a variety of inflatables for kids to bounce and play – a great way to burn off energy inside! They also provide play groups, kids parties, and other special events. At Helium Trampoline Park, there are 130+ interconnected trampolines which means lots of jumping fun! Some of the activities they have include extreme dodgeball,a laser maze, human hamster balls, jousting on their gladiator beam, and a rock climbing wall. There are designated Tot Times for kids walking through five years old to come and have a blast bouncing on the trampolines. Adults may not jump with the kids for safety reasons. Lotza Fun Room is an ideal indoor playground for children up to five years old. Their playroom features a climbing wall, a theatrical stage, a ball crawl, a jump house, a circus canopy, a playhouse, and more. It is set up so you can see the entire play space so you can relax while keeping an eye on your child. The Play Zone is an indoor play space that features bounce houses, archery, arcade games, rock climbing wall, remote control cars, and more! Pump It Up has giant inflatables and offers open jump days plus designated times for kids ages 2-6 years old so they can play without older kids also running around. They host fun special events, such as Super Hero Smash. They provide private parties and group events, so you are not sharing the space like you typically at other indoor play place birthday parties. Lightspeed provides thrilling indoor entertainment with a laser tag adventure, electric go karts, and an arcade. There are two seater family go karts so even younger kids can join in on the fun. Kangaroo Milwaukee offers a place to take the kids to play, eat, and bounce. There are inflatables and arcade games. You can book parties and they have later evening hours whereas most other indoor play places close earlier. Incredi-Roll is more than an indoor roller skating rink. They also feature bounce houses, laser tag, and an arcade. Fun-Timez! features rock climbing, 6 inflatables, an Adventure Jump, a virtual playground, an arcade, and laser tag. StoneFire Pizza Co. is more than just a pizza parlor. They have climbing walls, bumper cars, mini bowling and more! There is a fun Discovery Room designed for children under five years old. The Ozaukee Sports Center has an arcade and laser tag indoors, but they also have an outdoor mini-golf course, bounce house, batting cage, and pitching tunnel. Also a play field for running around or playing soccer or kickball. You'll want to check it out! 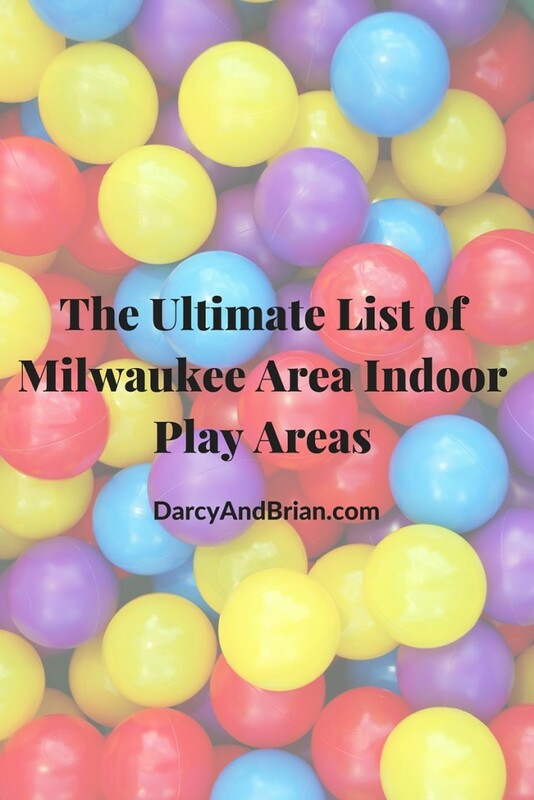 We've played at several of these indoor play areas, but are always interested to hear about new ones that open up. Have you been to any that is not on this list? Let us know in the comments below or send us an email. Your first time going to one of these places? Check their website to see if you can print off their waiver form. Several have them available for you to download, which saves time at check in!